Roksan Xerxes 20 Plus (Package) review | What Hi-Fi? In an age where product lifecycles are measured in months, it's comforting to know you can still buy something like the Roksan Xerxes. The basic design originated in the 1980s, and it's been developed in all areas since then. The 20 Plus is the best made, best engineered and best sounding Xerxes yet. The Xerxes has always been a visually subtle deck. While many rivals make strong design statements, the Xerxes looks discreet – but delve deeper and you'll find what remains one of the most innovative record players available. The basic plinth construction is triple layered, separated by carefully tuned decoupling: this isolates the record playing surface and cartridge from external vibration as well as any possible sonic degradation from the motor. The motor housing is free to move around its vertical axis, ironing out any speed irregularities, and the bearing impressively minimises mechanical noise. Other highlights include a two-piece platter, which has high inertia without lots of weight, and a spindle cap that can be removed once the record is centralised, to minimise transmission of noise from the bearing to the record. We could go on and tell you more about the deck's high quality outboard power supply, but we're sure you get the idea: this is no me-too turntable. The Plus version improves on the original 20 by having superior isolation between the plinth layers, a better performing bearing and a new design of platter and sub-platter. These changes don't change the character of the deck, but they do make it notably better. What can we say about the Artemiz 2 tone arm? It's beautifully made and sonically a great partner for the Xerxes. 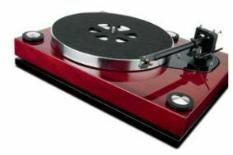 For this review, we used Ortofon's classy Kontrapunkt C – just over a grand's worth of moving coil cartridge and a sensible starter model for a record deck at this price level. The Xerxes has always been a resolution king. It uncovers masses of detail and organises it with remarkable precision. Listen to some hard-charging music like Nirvana's Nevermind and the Xerxes hurtles along like a thing possessed. In terms of timing, dynamics and punch, this deck is up there with the best money can buy. The Roksan has exceptional agility and defines the start and end of notes superbly. The improvements refine these strengths, and make the 20 sound even more controlled than before. There's also extra body to the sonic presentation and a greater sense of authority. Low-level nuances are even more explicit, making Michael Stipe's vocals on The Sidewinder Sleeps Tonite easier to follow than ever. The Xerxes is a class-leading deck that just keeps getting better. Every iteration has been an improvement on the last, and it's Roksan's policy that most of the modifications are retro-fittable. That means that even the earliest decks – which are now almost 25 years old – can be brought close to the latest spec. In this world of built-in obsolescence, that's a welcome breath of fresh air.